The courses are designed for emerging researchers with an interest in the socially and intellectually compelling fields of disasters, risk and resilience. They have been developed for PhD (or prospective PhD) students in East Africa who are at proposal development stage, and/or are developing their research methodologies. The courses have also been crafted for senior risk managers outside of academia who wish to sharpen their risk and resilience research skills – to keep abreast of developments in the field. From an interdisciplinary perspective, the courses are conceptualised to integrate the biophysical and social sciences. They intend to provide a two-way immersive bridge so that attendees with skill-sets in the natural sciences can strengthen their capabilities in research design and survey methodology, just as readily as emerging social science researchers with disaster, resilience or risk-related topics can fast-track their understanding of natural hazards processes and risks. The Risk Methods School is organised over two weeks, with four thematic streams running in parallel. Three streams will offer two x five-day intensive courses, while the specialised disaster methods course will only be offered in Week 2 (see below). 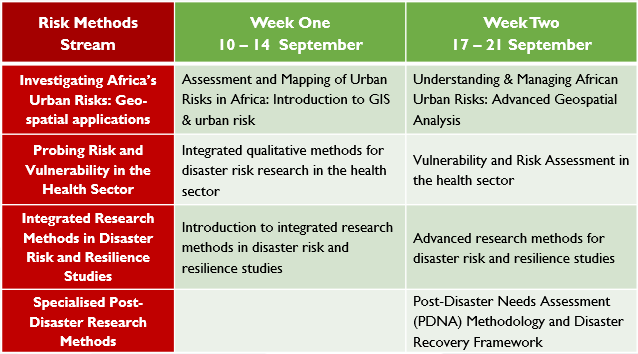 This choice of courses reflects many of the emergent risk and resilience research priorities in East Africa. Course attendees may attend up to two courses (one per week). They can enrol in either one course only or two courses (back-to-back) within the same stream. They may also ‘cross between streams’, as long as they comply with pre-requisite criteria for course admission. On successful completion of one or more courses, attendees will receive a certificate of completion from Ardhi University. The course fee of $800 per participant per week covers the course tuition, training materials, tea break refreshments, lunch, and study visits. If a participant takes two courses, one in each week, the course fee will be set at $ 1,300 in total ($650 per week). Each successful applicant will be advised of Ardhi University banking details, accompanied by an enrolment reference number to expedite their payment. This will be communicated after the application is approved. Completing the application process does not mean automatic or immediate acceptance to the Risk Methods School. All applications are reviewed by the School organisers, who will respond back within a few days to inform whether an application has been successful or not. Successful applicants will be provided with banking details of the Risk Method School Organisers and a reference in which to make their payments for attending. All participants will additionally cater for their travel expenses, accommodation, visa application, insurance, and other personal expenses. Accommodation and shuttle services can be arranged upon request. The Risk Method School Organisers will also provide invitation letters for the trainings should it be necessary. CLICK HERE TO GO TO THE RISK METHOD SCHOOL WEBPAGE TO APPLY ONLINE.